The story of fifteen-year-old Elizabeth Eckford and eight other African-American teenagers still takes my breath away, even though I lived through it on live television. 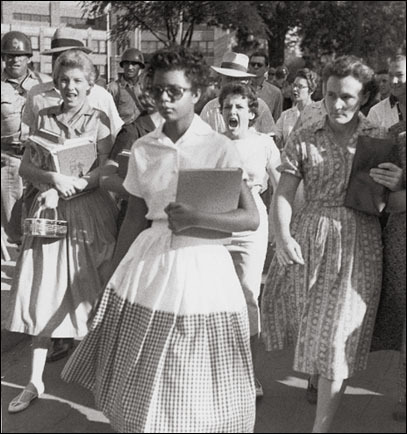 I relearned the story last week on a visit to Little Rock, Arkansas, Central High School, the site in 1957 of ugly, beautiful and inspiring events that changed America. Returning to Los Angeles I discovered that my friends of baby boomer and subsequent generations knew nothing about what happened outside Central High School on September 4, 1957. Like the story of the Israelites flight from Egypt and the story of the first Thanksgiving, the Central High School story merits retelling every year. After the US Supreme Court ruled in 1954 that segregated schools violated the Constitution, the Little Rock School Board developed a plan to gradually integrate city schools, starting by admitting nine African-American students to prestigious—and white only—Central High School. On the eve of the first day of school, September 3, 1957, Arkansas Gov. Orval Faubus ordered troops of the Arkansas National Guard to Little Rock to prevent the nine children from entering the school.